One Catholic bishop in Texas was appalled to see Democratic politicians in New York cheering the passage of a new, expanded abortion law in the state, and he’s not staying silent about it. 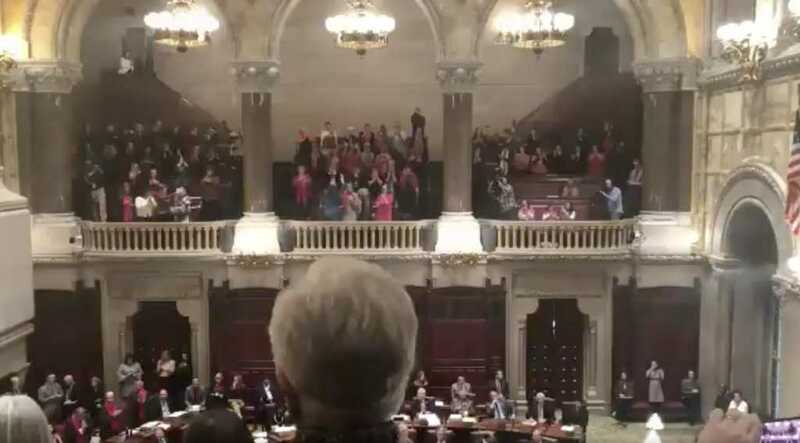 The video of the “celebration” of New York legislators as they condemned even full term unborn children to Death by Choice is a scene from Hell. Woe to those who ignore the sanctity of life, they reap the whirlwind of Hell. Stand against this holocaust in every way you can. Strickland also shared a tweet from Fr. Rick Stika, a bishop of the Catholic Diocese of Knoxville, Tennessee. Stika said he would “issue an excommunication” of a Catholic governor in his jurisdiction who signed into law the same pro-abortion legislation as Gov. Andrew Cuomo (D), who is a self-professed Catholic. And after signing the radical bill into law, Cuomo ordered the spire atop the One World Trade Center in New York City to be lit up in pink lights, a sign of solidarity with abortion advocates and Planned Parenthood, the nation’s largest abortion provider. As for the possibility of Cuomo’s excommunication by New York Cardinal Timothy Dolan, Catholic News Agency editor-in-chief J.D. Flynn suggested in The Washington Post that it seems unlikely the governor would face such a consequence for signing into law the Reproductive Health Act. While there is one excommunicable offense that deals with abortion, Flynn noted, it applies only to an unrepentant Catholic directly involved, in some way, with an abortion.